It was an unexpected joy to be in Lebanon once again after having spent ten days there in last December. The invitation sent to our community of Taizé by the Patriarchate of the Greek Orthodox Church of Antioch to be present for the installation of their new Patriarch, John X, was an opportunity to express once more our solidarity with Christians from the Middle East. The headquarters of the Greek Orthodox Church of Antioch have been, since the 14th century, in Damascus. Two ceremonies were organized for the installation : one in Damascus and one Beyrouth. 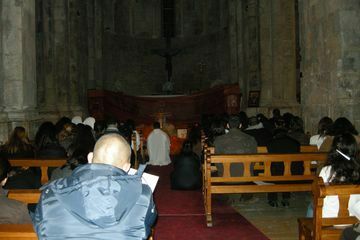 It was not possible to be in Damascus, but in Beirut, my thoughts were often turned towards the people of Syria. I was able to say to the new Patriarch, who lived for many years in Europe, how present Syria is in our prayer at Taizé. Many Orthodox bishops and bishops from other churches took part in the ceremony. Among them the Partriarch’s brother, who is bishop of Aleppo. When I told him how much his people were present in our thoughts and prayer, he immediately said : “When are you coming to Aleppo ?” The Church of Antioch is one of the first Christian Churches and was founded by the apostles Peter and Paul. It is in Antioch that the disciples of Jesus were given for the first time the name of “Christians”.